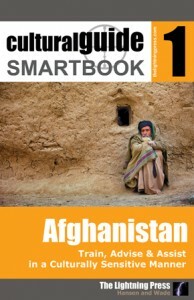 Announcing our new Afghanistan SMARTbook! Cultural Guide SMARTbook 1 – Afghanistan (Train, Advise & Assist in a Culturally Sensitive Manner) contains information designed to enhance knowledge of Afghanistan, including history, politics, country data and statistics, and the military operational environment. Topics include Afghan cultural influences: ethnicity, economics, government, and the Taliban; Train, Advise and Assist topics: working with host-nation forces, developing host-nation security forces, working effectively with foreign security forces, conflict resolution and meetings, linguist support and interpreters; a chapter on life in Afghanistan (a practical view); and Afghanistan national and provincial data. Download a free PDF sample and learn more at: Cultural Guide SMARTbook 1: Afghanistan (Train, Advise & Assist in a Culturally Sensitive Manner).